Need Your Light, the fourth full-length from Brooklyn's Ra Ra Riot, is the sound of a band being reinvigorated by their own existence. Correspondingly, the album sees the band  Wes Miles (vocals), Mathieu Santos (bass), Milo Bonacci (guitar), Rebecca Zeller (violin), and Kenny Bernard (drums)  getting back to their house party roots without abandoning the more heady soundscapes they explored with 2013's Beta Love. The result is an album that's celebratory without being solipsistic and that sees the group collectively mining their prior experiences in order to craft something that looks toward the future with an optimistic gaze. 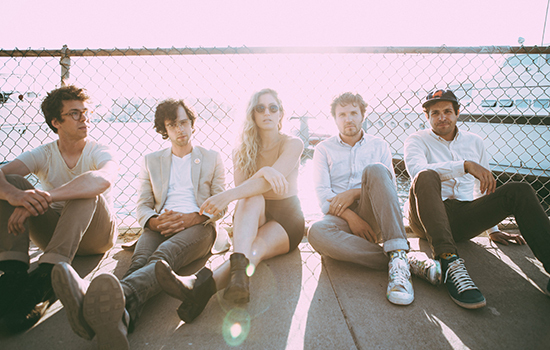 Ra Ra Riot had planned for a longer break after Beta Love. However, after a few months, they couldn't help themselves from working on new music. "The inspiration came very quickly," Miles says, explaining that he decided to fly out to Los Angeles to work with previous producer Dennis Herring (Modest Mouse, Elvis Costello) in order to start fleshing out ideas. Shortly afterward, the group went on a writing trip to Milwaukee and soon found themselves crafting Need Your Light with a host of previous collaborators, including Ryan Hadlock in Seattle (who produced 2008's The Rhumb Line) and Andrew Maury in Brooklyn (a longtime friend, collaborator and live sound engineer who also co-produced 2010's The Orchard). Also in the mix  as he has been since the band's inception  is Vampire Weekend's Rostam. He has a long history of working with Ra Ra Riot (including the Discovery project with Miles), yet this marks the first time he's actually taken on the role of producer for the band. Whether Miles is singing about something fantastic or mundane, there's an enduring energy to the songs on this album which illustrate that in many ways Ra Ra Riot are still only getting started. Barsuk Records is proud to announce a 10th Anniversary reissue of Ra Ra Riot's debut album The Rhumb Line on August 17, 2018. Originally released on August 19, 2008, The Rhumb Line was hailed as "a blissful chamber-pop breakthrough" in a 4-star Rolling Stone review (who included it in their top 40 albums of the year) and praised by Time Out New York as "classically pretty, but without getting all fussy about it." "This has been a fun opportunity for us to consider how long we've been making music together, and how lucky we are because of that. We never want to take anything for granted, and we're so excited to revisit this record  which is still really meaningful to us  and share it again with the world," said bassist Mathieu Santos. Vocalist Wes Miles added these details about the reissue itself: "It's beautifully redesigned by our own Milo Bonacci with a second disc of unreleased gems, live tracks and demos. It's a real alternate universe Rhumb Line double LP." In the poignant liner notes for the reissue, Santos notes, "The Rhumb Line, like most debuts, is the sound of the band becoming. Along with producer Ryan Hadlock, engineer Matt Doctor and our drummer Cameron Wisch, we spent a total of six weeks living in the studio's converted barn and trying, somehow, to compress two years into ten songs. Naturally, the specter of John [Pike]'s absence permeated every last moment of the sessions, but once we had decided to see the album through  to celebrate the songs we had developed together, to honor the dreams we had all shared  the burden, however slightly, first began to subside. For a moment, there was no baggage, no despair, no expectations  there were just some kids in the woods making music." This 10th anniversary reissue includes the original album plus 11 additional live and demo tracks, 9 of which are previously unreleased. The album will be available digitally and as a limited-edition 2xLP set, hand numbered and limited to 2,000 copies worldwide. The limited edition vinyl will be bound in a linen-like cover with gold-foil stamping. In addition, available for pre-sale now at RaRaRiot.com, the band will be offering an alternative version with blue-foil stamping and opaque blue and gold colored vinyl, limited to 500 copies.